With Idle No More entering a new phase (one we might simply call “Winter” – a time for Anishinaabe people to reflect, tell stories, educate and plan for the future), there is much to consider concerning the previous two months of spirited activism. For me, there has come the realization that there’s been a general absence of attention paid by the movement to the role of provincial governments in perpetuating the challenges facing Indigenous communities. Considering that Idle No More has been a movement about protecting the land, it’s curious that the provinces — which have “jurisdiction” over lands and resources — have been left alone. That should change. Recently, the Ontario Premiership changed hands after Kathleen Wynne won her campaign to become the new Liberal leader (and hence Premier) in late January. Many in First Nations communities were actually pleased by this development. As Minister of Education, Wynne spearheaded the 2007 First Nations, Metis and Inuit Education Policy Framework, and, as Minister of Aboriginal Affairs, she visited numerous communities in central Ontario, even supporting the Anishinaabek Nation’s desire for increased jurisdiction over social policy. But, that said, she’s also demonstrated no willingness to deviate from the existing provincial approach to land and resource management in the north, an approach that can only be described as colonial. As Wynne elaborated on her plans for transit, rural Ontario and the economy, lawyers representing Ontario were putting the finishing touches on their appeal of a 2011 Superior Court decision that had ruled the treaty rights of the community of Grassy Narrows (Asubpeeschoseewagong) trumped Ontario’s right to issue timber harvesting permits within Ojibwe territory. While the court effectively said that the right of the Grassy Narrows people to feed themselves was greater than the right of Ontario to allow multinational pulp and paper companies to clear-cut old growth forests, lawyers representing Ontario disagreed, and they are currently trying to override treaties and steal jurisdiction of the community’s lands and resources. 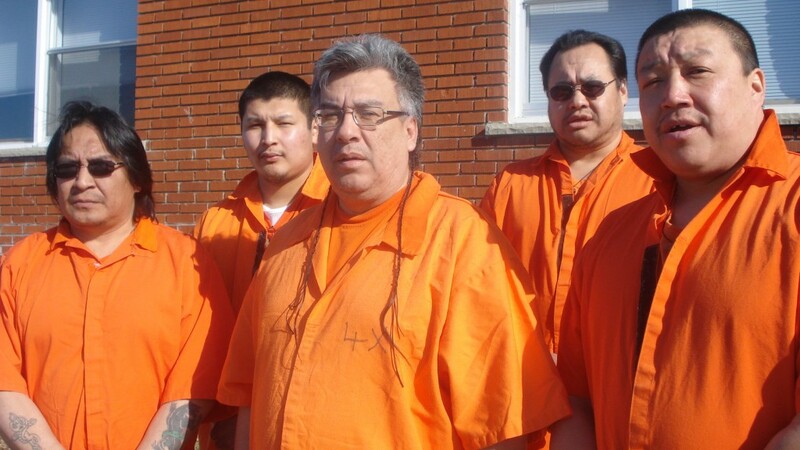 Grassy Narrows isn’t alone in experiencing this type of assault. In 2008, Ontario filed injunctions against the Chief and Council of Kitchenuhmaykoosib Inninuwug (KI), who had parked their boats in the path of float-planes carrying prospectors eager to exploit platinum from Inninuwug territory. The community ignored the injunction orders; consequently, the Council was sent to jail for six months. A nearly identical scenario occurred in Algonquin territory that same year when community members were ordered by injunction to end their blockade of a uranium mining road. They refused and likewise ended up in jail, serving six months for their efforts at preventing such exploration on unsurrendered Algonquin lands. On the heels of these oppressive approaches to the relationship, the province sought to institutionalize a process to mitigate these conflicts (as well as continue to facilitate development). In 2010, Ontario introduced the Far North Act (Bill 191), claiming that its purpose was to provide “land use planning in the Far North that directly involves First Nations.” Indeed the legislation employs the term ‘First Nation’ fifty-five times in 24 terse sections. And yet, literally as the legislation was being passed, Anishinaabe people were protesting on the steps of the legislature. They had even “condemned” the new law. assign ultimate control of the land use planning process entirely to the government (not only are community land use plans subject to ministerial approval, they can be re-opened and violated at his/her sole discretion). 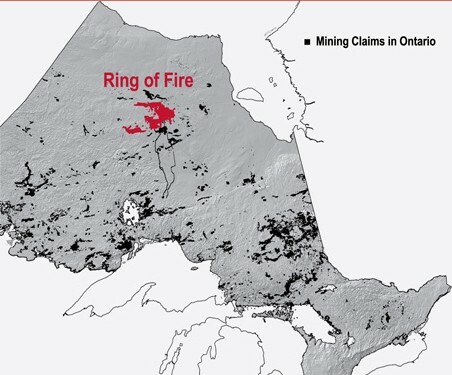 This discussion is all the more salient when considering the so-called northern Ontario “Ring of Fire.” That’s the name attached to the discovery of a wide band of chromite, a find some consider to be the “most promising mining deposit in a century.” (For a better sense of the Ring relative to area First Nations, see these Toronto Star and National Post graphics.) 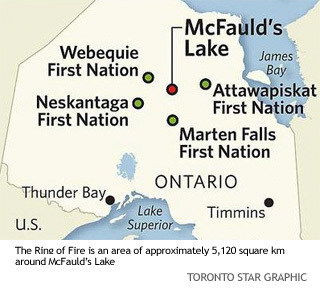 Ontario is keen to exploit the resource, even creating a “Ring of Fire Secretariat” to co-ordinate and accommodate the various interests/stakeholders in the north, including the Anishinaabe and Mushkego peoples. Indeed, when Marten Falls First Nation expressed concern with the project, the Minister of Mines was on the first plane out to deliver fresh fruit and Government of Ontario golf shirts, hoping to smooth over relations. But what cause do we have to believe that Ontario is changing course from its colonial approach to the north? Will the Ring of Fire be any different from the relationship with Grassy Narrows, or KI, or the other fifty northern communities affected by the Far North Act? Can we put faith in a sympathetic new Premier to change trajectory? Leaders like Donny Morris, Chief at KI, are skeptical. In fact, he was recently forced to tell Ontario: “Your policies don’t apply… get out of our territory.” We should all take heed, for the hardline may be the only way to prevent the continuing disrespect and exploitation of lands and people that is common practice for provinces in this country. Moreover, if the people in the Idle No More movement are serious about protecting the land (and I believe they are), they might consider a shift in emphasis: a shift toward bringing pressure on provincial governments, the institutions most often alienating Indigenous people from their lands in contemporary times (be it in Ontario or elsewhere). Whether it’s organizing rallies/protests at legislatures, providing resources for court cases, spreading awareness about northern policies, supporting lobbying organizations like NAN and Treaty #3, even hosting public debates on the utility and viability of economic development in the north, this is one fight that some in the Idle No More movement should consider joining. Winter will be over soon.